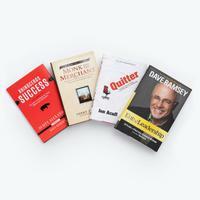 Save on Dave's most recommended business and leadership books in our exclusive bundle! Dave has grown his company into a winning national brand with more than 800 team members who have impacted millions of lives. EntreLeadership is how he did it, mistakes and all. This is 20 years of real-world experience with all the sweat, tears and prayers. This is how his company has been named one of the Best Places to Work in Nashville 10 times. It’s proven. It’s practical. And it’s how you can do it too. Dave Ramsey has taken commonsense leadership principles and made them uncommonly practical, useful, and life-changing. His straightforward and plain-talk approach is refreshing. Even more admirable is that his advice is not a bunch of leadership frou-frou fluff, but it's solid and substantive. Every entrepreneur is searching for the elusive formula that perfectly blends the creativity of the start-up with the leadership qualities to guide a growing team. 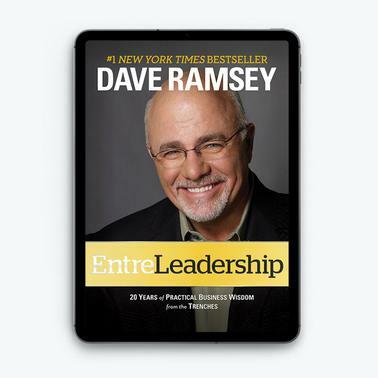 Dave Ramsey reveals the ingredients in EntreLeadership, a guide for the complete business leader. S. Truett Cathy – Founder and CEO, Chick-fil-A, Inc. Throughout my career, I’ve been blessed to spend time with millions of quality leaders at practically every level of every industry—and I haven’t met one yet that could not benefit from the clear, practical business principles Dave lays out in EntreLeadership! Dave Ramsey is a straight-shooting, no-nonsense, faith-anchored blessing to our world. Each time he speaks, millions of us listen up and learn. Dave leads one of America’s most successful organizations. Learn from his commonsense counsel. You’ll be glad you did. How do I know Dave Ramsey’s EntreLeadership book can help every small business? Because my son, as CEO of our company, attended Dave’s EntreLeadership ultimate business experience and applied the principles in our company with dramatic results. The difference is bigger than black and white—the difference is between red and black! David Green – CEO and founder, Hobby Lobby Stores, Inc. I love this book! One minute Dave sounds like a Harvard prof, and the next minute he is coming at you like an alley fighter! Either way you will wind up being a better leader.